Thoughts of THAT Mom Thoughts of THAT Mom: SOS Mom Saver: Save Your Child's Life!!! SOS Mom Saver: Save Your Child's Life!!! This won't save you time or money, but it very well could save your life or that of your children. It's not a gimmick. It's a safe way out of the house should a fire leave you or your children trapped in a room. You can buy the one linked above at Amazon.com or you can purchase one in person at Walmart. Ideally, you should have one for each bedroom that is slept in. If you can't buy all of them now, start with one. One is better than none...and at least gives all of you an escape should you be trapped upstairs. No, this isn't a pleasant topic, but it's an important one. After hearing yet another story of a child dying because they didn't have a way to escape from a second floor bedroom...it was time to broach the topic. I was shocked to hear a friend say that she didn't even know these existed. 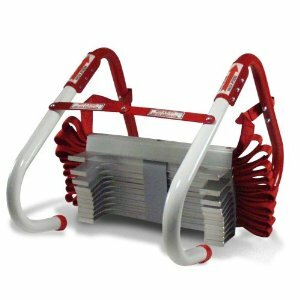 Disclaimer: If you click on the above link and purchase the ladder, then I will get credit for that purchase as a part of the Amazon affiliate program. However, I don't care if you purchase through that link. I DO want you to buy this item if you don't already have one and live in a multi-story home but could care less whether you do so through that link, by going directly to Amazon, or by driving to your local Wally World! Just please buy one. K? Thanks. We already have one of these...Sits right under soleils window at all times. It seemed an obvious purchase for a 2 story home, so I'm suprised more people aren't aware of it.. Have had ours for years, and it still provides some peace of mind. I Highly recommend them. I was surprised when I brought it up with a friend (who has a 2 story house) that she had never heard of them. I thought EVERYONE knew about these!! Apparently not. Then it occurred to me: If SHE doesn't know about these, then how many OTHER people don't either? And I had the opportunity to do something about that...so I did!